The point I’ve reached with my chosen areas of scientific interest, specifically astrophysics, is a great distance from my undergraduate Introduction to Astronomy class at UCLA with the late Professor George Abell (pronounced "A-bell"). The course was widely known as “Astro 3.” I enjoyed the class well enough, but I wasn’t actually that interested in the subject. It is too bad because had I got to know my teacher better, I would have known the foremost researcher in galaxy clusters of the day. Dr. Abell created the Abell catalog of galaxy clusters. Dr. Abell had an infectious teaching style, full of enthusiasm. Sadly not all my peers were as responsible as they should have been while attending a world-class university. I recall how he would, in a moment of frustration, throw a chalk board eraser across the huge 300-seat lecture hall at a group of fraternity brothers who wouldn’t stop talking during his lecture after repeated warnings. Another memorable moment was when Abell personally illustrated the principles of force and inertia with the ubiquitous “bed of nails” demonstration. My favorite Hubble image represents a golden memory of my late professor. 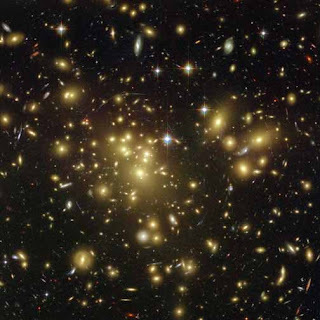 The image is the Abell 1689 cluster. This Advanced Camera for Surveys (ACS) image is impressive because so much is conveyed in just a single picture. It dramatically demonstrates the immense nature of the universe, showing one of the most massive galaxy clusters known and which also acts as a gravitational lens. The science world could use more people like Professor Abell and his significant contributions to the field, as well as his fine tuned ability to articulate the science to others. OMG! Ihad Prof. Abell too. He was great teacher and I learned alot.